Mississippi Gulf Seafood is simply the best! Most people visit the Mississippi Gulf Coast for their world-class golf courses, 24-hour gaming at one of the barefoot/luxe casino resorts, or for some sunbathing on the world’s longest (26 miles) man-made (talcum soft white sand) beach overlooking the sparkling Gulf of Mexico. And who doesn’t appreciate their famous Southern hospitality? But as far as I’m concerned, the reason I’m already planning a return visit is their exceptional food scene that has emerged, yet again, after Hurricane Katrina. 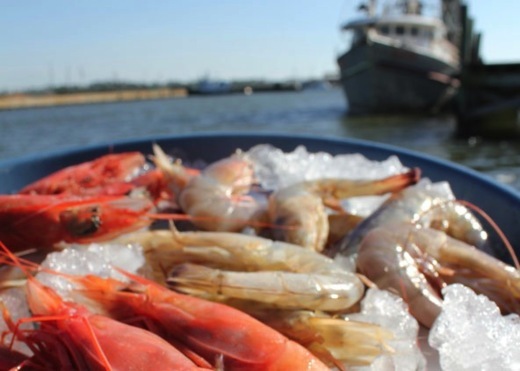 From shellfish shanties to Po’boy trucks to BBQ sheds all the way to four-star Steakhouses that give Ruth’s Chris a run for its money, the Mississippi Gulf coast has something for every palate and budget. The locals are fond of saying that “Love in the South is spelled F-O-O-D” and after spending a calorie-laden (but soooo worth it) few days there, I have to say that these folks really do live to eat. Hiding under a mountain of powdered-sugar, the best piping hot beignets can be found at Triplett-Day Drug Co., a 59-year old, family owned pharmacy, soda fountain and gift shop. Triplett’s feels so authentically old-fashioned, that I almost expected “the Fonz” to walk in. The secret to these grease-free, lighter-than-usual lovelies is that they are made from biscuit dough. 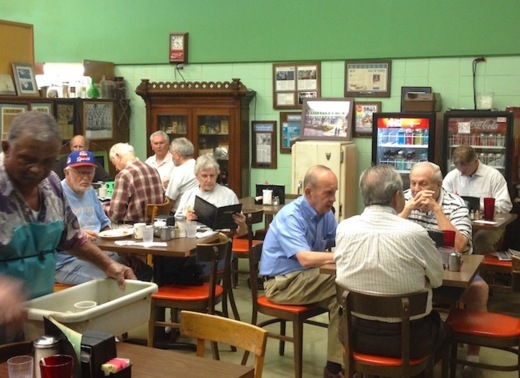 It was a hoot watching the tables full of breakfast club regulars who gather daily to smooze over morning coffee and beignets. IT: (Insider Tip) The equivalent of “hitting the jackpot” would be if you happen to visit when “Liver & Onions” is offered as the daily blue-plate special. This dish is so popular that locals will add their name to a call list in order to get advance notification. Although the family-owned, McElroy’s Seafood Restaurant doesn’t officially open until 7:00 am, if you’re jet-lagged you can join the locals, who often show up at 5:30 am, when the kitchen staff arrives, sipping coffee at the counter until the place opens. Not for lightweights, the enormous pancakes spill over the 10 “ plates. They recently reopened their Biloxi location since the original café was completely demolished by Hurricane Katrina. The new one, perched high on stilts, overlooks the Biloxi Small Craft Harbor and the ocean. IT: If you have the appetite of a lumberjack (or a Georgia shrimper) the morning shrimp & grits will keep you full until dinner…the following night! If you’re like me and think there is no such thing as too much crab, wear something you don’t mind getting butter drippings on and head over to the iconic Mary Mahoney’s, located in a sprawling home, circa 1737. It is divided into a variety of unique dining rooms or you can dine in the open courtyard shaded by a 2,000-year-old giant oak tree. Start with their addictive mess of crab claws (offered broiled or fried) followed by a zesty lump crabmeat cocktail. Stretch your legs by taking a tour of the magnificently decorated rooms, best led by Mary’s gregarious son Bobby, who has inherited his mother’s legendary “Hostess with the Mostess” title. Bobby loves sharing historic “if these walls could talk” tales as well as entertaining you from his endless supply of jokes. One of Mahoney’s favorites is, “A bear and a bull are coming right at you. All you have is one bullet. Which do you shoot? The Bear. You can always shoot the bull.” Then back to the table for their signature dish of Shrimp and Lump Crabmeat St. Patrick, Mahoney’s rift on garlicky escargot. IT: Ask Bobby to point out Paul Newman and Joanne Woodward’s favorite table, the plaque by Denzel Washington’s chair, the watermark showing how high the water rose during Katrina and the framed Western Union Telegram President John F. Kennedy sent Mary. Ask nicely and he’ll even read you a passage from a John Grisham’s novel where he mentions the restaurant. A new, casual all-American spot (with Cajun overtones) Mindy’s Café, offers some might tasty shrimp & grits for breakfast, scrumptious catfish Po’boys and a knock-out Shrimp burger, which is funny since Mindy never eats seafood. 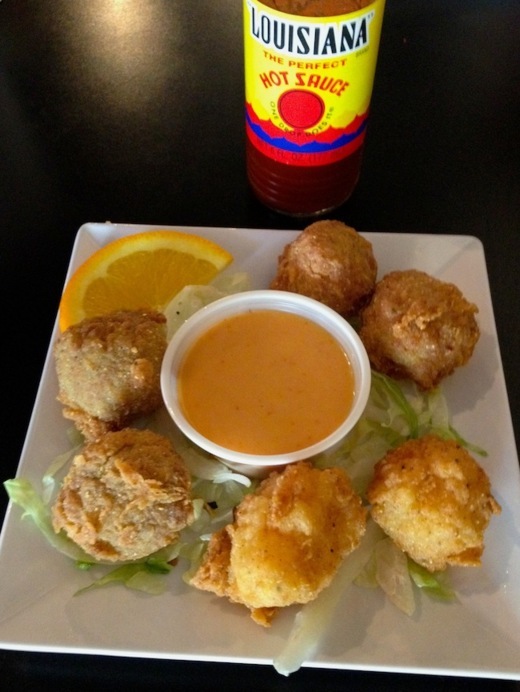 A not-to-be-missed nibbly is the combo of alligator, boudin and shrimp bites, all delicately fried and served with Rynole sauce (named after Mindy’s three grandkids, Ryleigh, Noah and Levi. IT: If you’re a craft beer lover, I’d order these as takeout to pair with one of Lazy Magnolia Beers, such as their best -selling Southern Pecan ale or my fave, the hoppy Southern Hops’pitality. Although it’s rare to encounter anything but great service along the MS coast, Dempsey’s super friendly servers deserve a special shout-out. For the undecided they might suggest the 3-Way Broiled Seafood platter (shrimp, oyster and redfish topped with crab meat au gratin) as the way to go, particularly since it comes with a cup of their famous gumbo. G.M. Diane Hennessy says it’s not uncommon for the restaurant to go through 40 gallons of gumbo a week! IT: You can also go ultra-healthy and order a heaping mound of fresh boiled crawfish or Gulf Shrimp. You’ll burn off most the calories just wrestling open the crawfish. In 2011, the historic 200 North Beach Restaurant became the first restaurant to reopen on the beach since Hurricane Katrina devastated the city. Originally built in 1903 to house The Sea Coast Echo newspaper, it was completely destroyed by the hurricane. 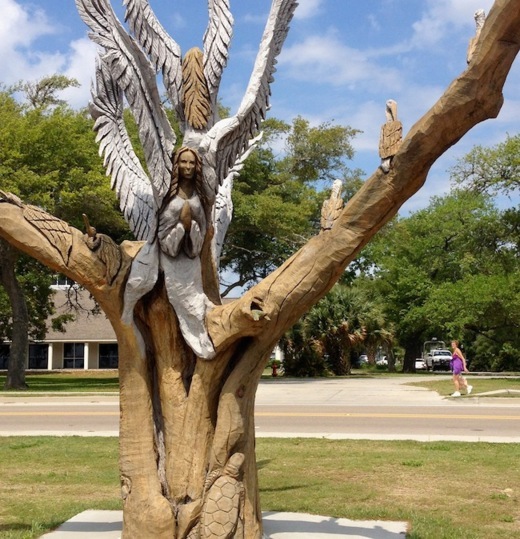 In front of the restaurant is an old tree whose branches had been carved to look like angels done by sculptor Dayle Lewis with the Kat-Rita Wood Project, a non-profit organization that turns hurricane scrap wood into art. Owner Ann Tidwell told us that during Katrina her son-in-law (who was a Hurricane Hunter pilot) neighbor and a dog, had miraculously survived by clinging perilously to the tree for hours. Talented Chef Mark Daniels adds his creative twist to New Orleans classics such as blackened Redfish served over Andouille hash, moist and meaty “no-filler” crab cakes, grilled lemon trout, and even a gluten-free pilaf. The people-pleasing homemade potato chips go well with one of the bar’s special Hurricane Hunter drinks. IT: Save a little room for Miss Ann’s Pecan Pie, made from an old family recipe, that comes gilded with chocolate and caramel. Half Shell Oyster House takes great pride in serving the finest quality, hand selected Gulf oysters. They continually shuck them throughout the day to ensure the freshest oysters possible. The no-stress way to go is with the Best of the Best, a combination of three Charbroiled Oysters, three Oysters Bienville, three Oysters Rockefeller and three Oysters Orleans. All I needed to go along with this was a half-dozen, pristine raw oysters to get my juices flowing. Extra credit points for the warm French Quarter decor which includes wrought iron, high ceilings, brick walls, classic lighting fixtures, stained glass and a copper bar. IT: Non-oyster lovers (horrors) can enjoy a variety of other seafood specialties, steaks, pasta, Po’boys, salads and New Orleans favorites such as gumbo and shrimp & grits. After my very first visit I joined the ranks of “Shed Heads”- loyal followers of The Shed, Barbeque & Blues Joint. What started out as a little 300 square foot take-out spot has grown into 9,570 sq.ft. hangout. 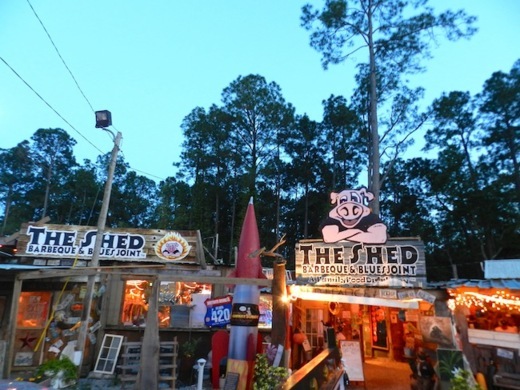 The Shed offers the complete package…superb, fall-of-the-bone “Que”, a whole line-up of award-winning Junk Free sauces, great beer selection, bonfires to huddle around, and kickin’ live music (for free!!!) There’s even a Shed Pimp (with his own business card) to hold open the door for you. No wonder it recently scored 1st Place Winner in Whole Hog Competition at Memphis in May 2013! IT: Another resto that helpfully offers combo platters, for peeps like me who can never decide which way to go. The go-to answer is their Shed Sampler Platter with Baby Back Ribs, Spare Ribs, Pork, Brisket, Chicken, and Sausage served with 3 sides and 2 BBQ breads. BR Prime, located in the Beau Rivage Casino & Resort, is the Coast’s premier, upscale steakhouse and a perfect choice for a glam evening on the town. Exemplary service (every request was met with a sincere “My pleasure”) stylish décor (more sparkle than a Swarovski boutique due to the dining room’s glass wine towers that house over 3,000 bottles-with at least another 10,000 in the cellar) and a sophisticated menu virtually guarantee a memorable evening. Kick off the festivities with a little wizardry provided by the liquid nitrogen added to a unique line-up of fruit martinis followed by the Grand Seafood Platter, laden with Maine lobster, shrimp, oysters, king crab legs, crab cocktail. BR Prime specializes in USDA Prime beef, much of which is dry aged in-house for 28-days, so this would be the time to get down for some serious meat-eating. IT: B.R.’s Executive Chef, Joseph Friel, cooked for years at NYC’s finest restaurants (before moving South and taking over the Beau Rivage restaurants) hence the Steak tartar “21 Club” on the menu and the fabulous bread from NYC Tom Cat bakery. Breathtaking panoramic gulf views provide the backdrop to thirty-two, perched (you guessed it) on the 32nd floor of The IP Casino, Resort & Spa. This Four Diamond Winner features all the classics- fresh Mississippi seafood and Prime USDA steaks, as well as some novel twists such as Escargot Hush Puppies and Salt Dough Grouper. It was hard not to overindulge on the tempting breadbasket, particularly the crispy cheese crackers. The whole staff could not be more accommodating, but kudos to Kendell, our almost psychic server, who steered me to the Cuke-Enrobed Salad, a still-art beauty consisting of Nueske Bacon, Roasted Tomatoes, Radishes, Rye Croutons, and Point Reyes Bleu Cheese, wrapped in long cucumber ribbons. Per Kendall’s advice, I followed it up with a delectable piece of Sea Bass generously topped with lump crab meat. IT: For a dramatic finale, order Bananas Foster, cooked table-side by my man Kendell- with great pizzazz! Southern hospitality is alive and well at the Beau Rivage Resort & Casino, Las Vegas Bellagio’s charming, more subdued, little sister property. 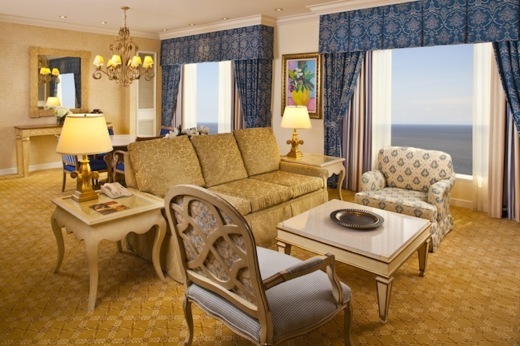 Offering tastefully appointed guestrooms, ove-rsized Italian marble bathroom with soaking tub and separate shower, a gorgeous pool and lounge area, full-service spa and a perfect beachfront location, make this a perfect home base for grazing the Gulf Coast. IT: They also have a state- of-the-art fitness center…I’m just sayin’.